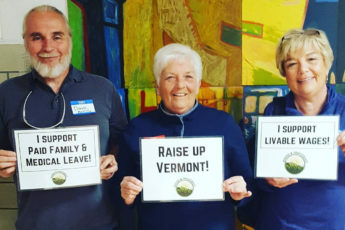 Your support of Rights & Democracy helps us move Vermont forward by creating happy, healthy, and just communities for all. Please join us by becoming either a monthly sustainer or an annual contributor, you can give through your bank, credit card, ActBlue, or by mailing a check. You will be part of a growing grassroots organization that is working for lasting change in the Green Mountain State. Joining RAD provides invaluable support for us to continue working on the key issues facing our state— social, racial, economic, and environmental justice. Together We Win.